For those fire-cracker kiddos in grade 1 and ideal for grades 2 and 3. There are opportunities for addition practice during the game, the end of the game involves adding 2 and 3 digit numbers. The French score board can be laminated and reused, French on one side and English on the other ensures that parents and volunteers can help out too. The handy dollar store containers (8 for $1!) can be sent home with students for practice over a holiday break. 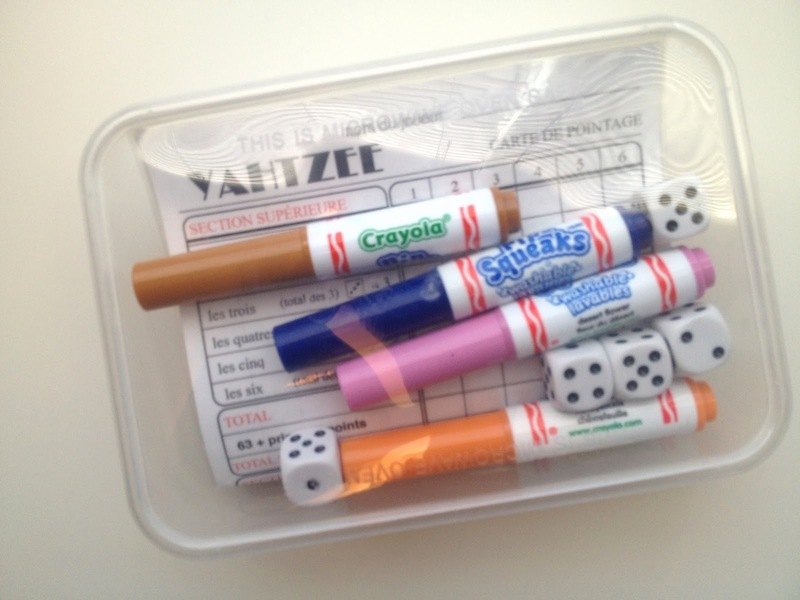 Students roll the dice into the container to avoid dice all over the floor! The game is available as an iPad app but the app does all of the addition work for you. Could you teach this game to a couple of keen math leaders and have them share it with other small groups once they've got the hang of it? Could you keep track of the all time Yahtzee high score for the class? 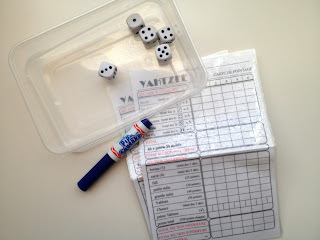 Could you roll 5 dice 100 times and predict how likely it is that you would roll a Yahtzee in 100 rolls on 100 day? Key component? Play a bunch at home for awhile so you know the game cold before teaching it. My household loves it. Epic moment was that memorable night when Monsieur Belle Feuille rolled double Yahtzees in back to back games, that's right, four Yahtzees in one night, epic.